Amazing work. What colors did you use? What model & length of boat is she? I have enjoyed reading your blog entries and am looking forward to hearing more about your renovations. Thanks for the reply. Looking forward to your other creative renovations. Are you guys cruising yet? I love what you did!! We are looking at buying a "well used in need of love boat" and this is exactly what I have in mind but haven't been able to explain to hubby. Totally inspired!!!!!!! Awesome, thanks!! I'm so glad that you found our blog then! I had a hard time explaining the color ideas to my husband as well, but he was happy to go along with it. I tried to get him to help pick out the colors, but he couldn't see the difference in any of the blue swatches haha! He trusted me to pick it all out and was so happy with the end result! I'm sure you'll have no problem finding a boat in need of TLC. Enjoy the adventure! Holy toledo! This is great! 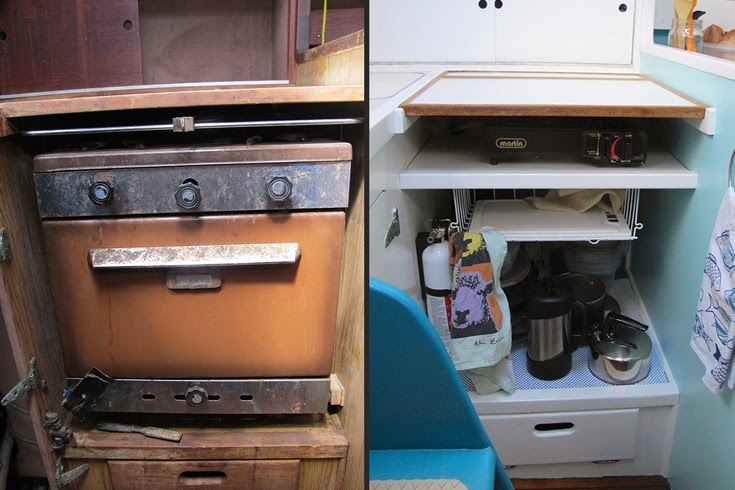 I'd like to include this post on The Monkey's Fist topic about sailboat interiors. I sent you an email about another post, but now I am perusing your site and finding more! Just fell head-over-heels in love with your boat!!! It. Is. Perfect. I love it! Excellent job and Brilliant ideas! Simply spectacular. I can't paint over all our woodwork... yet. Very inspired by the light / airiness with a punch of vibrant color! Was any of the wood you painted teak and if so did you do anything special before painting. We have an older boat I want to paint but everyone tells me I shouldn't paint the teak because of the oil in it. I love what you did! It is beautiful! Sorry a little late in replying...yes, some of the wood was teak and very oily. I painting it with Kilz Original oil-based primer and it sealed it up. I put 2 coats on it to be sure. I tried Kilz2 latex primer first, but the oils seeped right through. The Kilz Original works great! Hello there! I just found your site and love love love all the DIY's!!! Random question- has your interior paint held up in a marine environment since its application? I was told that it has a tendency to peel/flake off and am curious as yours is so beautiful! Thanks so much!!! Hello and thanks! So far our paint has held up, we'll see how long it all lasts. I don't think it would have stuck to the trim very well since we are always grabbing hold of it or bumping into to it (me). We did a stronger oil-based on the trim and it is really hard and holds up well. It does chip if you bang something into it obviously (also me). I will see how the latex holds up on the walls and decide if it was the right choice or if I should of done oil-based. The latex does feel a bit sticky, especially the darker teal color. I think an oil-based paint would dry a lot harder so maybe that is better. 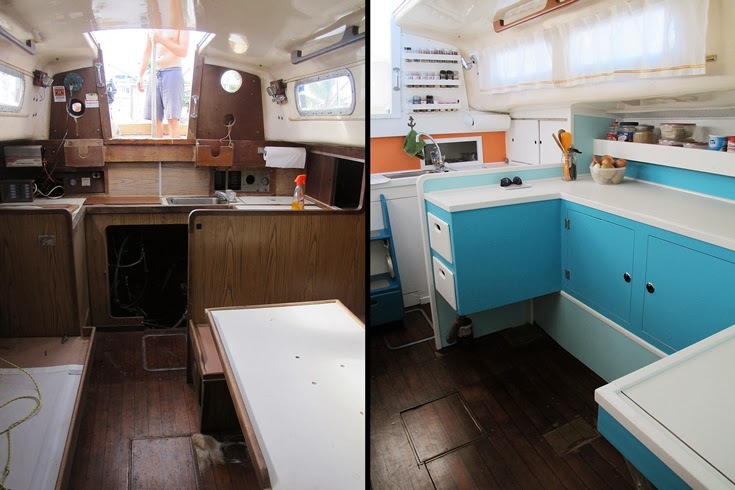 It was all an experiment really, because we couldn't find anything online about painting sailboat interiors and what to use/not to use. 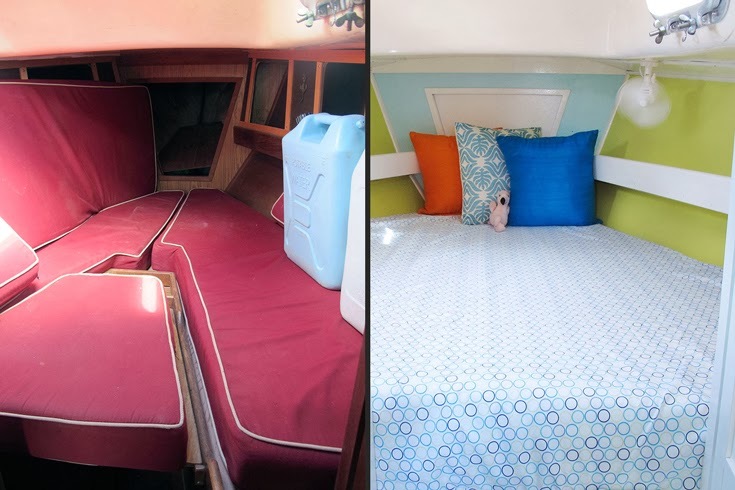 I'm hoping that this blog helps out some people on their boat remodeling journey! Thank you so much, finally managed to persuade the partner to let me paint. We have just bought a project boat that is in need of repairs too :) Will be saving your blog!!! Good luck on your project! We'll be back on our boat soon and have more blog posts to come! Yes haha! Well just to the left of the sink on the counter actually. We put a rubber mat (like a sink liner) on the counter so its not slippery and you can easily clean it off. 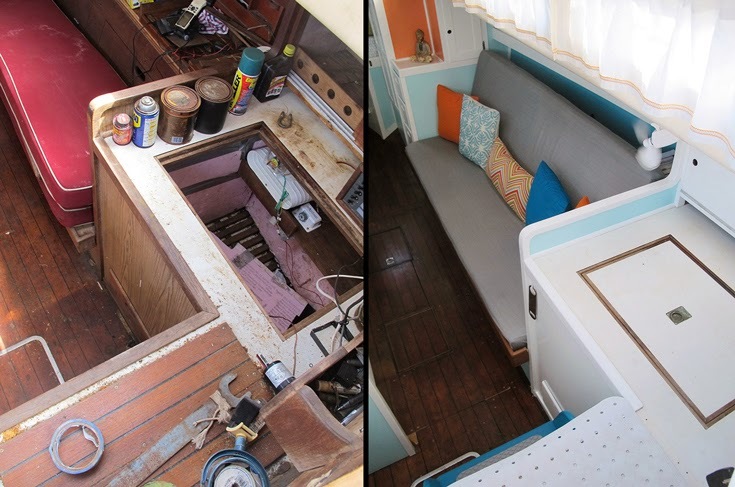 I Love Love Love how you converted your port settee!! Thanks for sharing! Is this the same boat that was in an article in Sailing magazine? I recognize the colors as I loved that article but have lost the magazine. I cannot believe my good fortune to run across this webpage while looking up info about RLG. I am gobsmacked. Yes that was us!!! How funny that you found us again! I'm glad you did. We just got back on the boat this week are prepping to splash. We'll be adding more blog posts very soon as well! That is a truly incredible transformation. I absolutely love it, I've always wondered what an interior would look like without all the wood finish that you normally see. Too bad my hubby likes natural wood so much or I would totally do this to our boat. I just randomly stumbled across your blog from pinterest today and it's inspirational. Hubby and I have been talking a long time about getting a boat but it still somehow feels like a distant plan. Your webpage makes me think of the Nike slogan.. Just Do It! Wow, this is so non-traditional and inspiring. 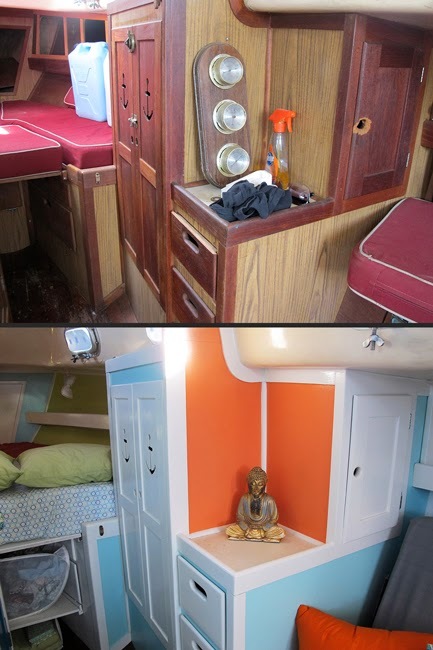 I was going to repaint the bulkheads white again, but I might be thinking differently now. Thanks! White looks great and is just as brightening! I was originally going to do white and leave the trim wood, but I obviously got a bit carried away haha! Surrounded by Caribbean colors for a few years was my inspiration. Good luck! Hello Linda! I'd never seen an Allied 39, but they look almost identical don't they?! You guys have done a great job on her and looks like you have just a bit more room which must be very nice. I love the cut-out nonskid on the steps, great idea! Sounds like you guys have done some amazing traveling. Are you in French Polynesia now then? How wonderful. We'd like to do that someday too. We have enjoyed reading your blog and will keep up with you. Very inspirational! Nice work, but more importantly very nice prep work. That's the defining difference in overall superb finish. The colours are all lovely. Enjoy! So true, thank you very much! I LOVE this! We have a very colorful home and this just gave me an "Aha!" moment - why not also on the (future live aboard) boat! I love how you lightened up the "traditional" look - what a beautiful space. Anchors aweigh! Matt was smart to let you pick out the color palette! What a breath of fresh air seeing what you two have done! I too had seen some pics in the magazine and now stumbled across your blog via The Red Thread. Beautiful work - thanks for sharing! Haha no kidding! Matt was ready for me to make up my mind and pick the colors already :) I was like "this one or this one" and he trusted me to choose on my own (and he couldn't tell the difference between the colors haha). So glad you saw the article in Sailing Magazine! I just looked up The Red Thread and am now following them too! I found your blog through Monkey Fist. 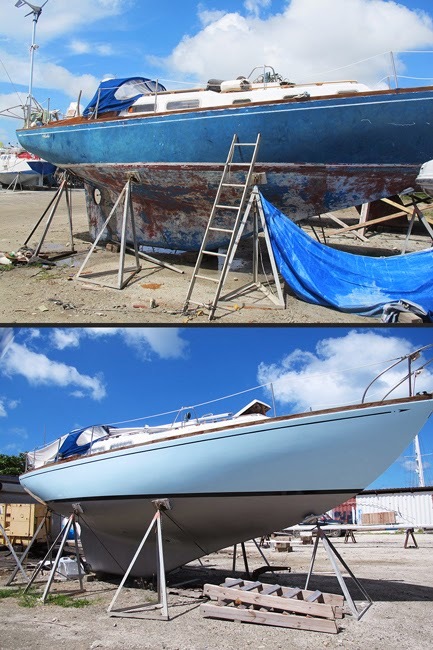 You have done an amazing job of restoring your boat. I absolutely love the bright sunny colors. The paint job on the exterior is beautiful! 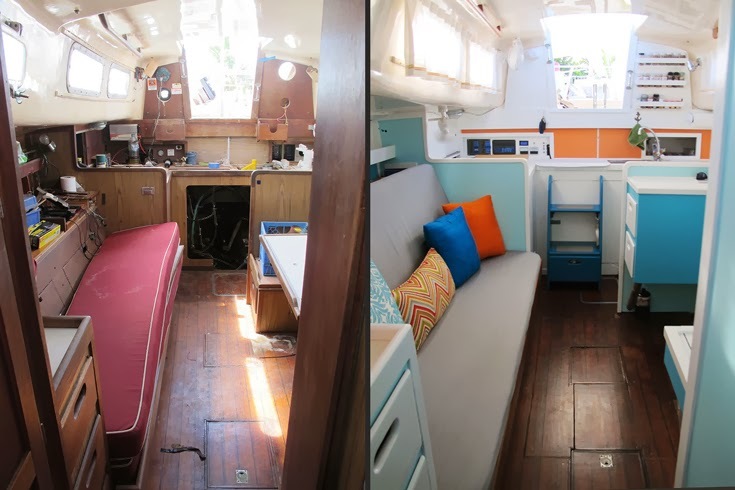 We just purchased our second boat and I am starting the whole decorating process again. It is super fun. Thanks for the inspiration! Thank you!! So great that Monkey Fist mentioned us! 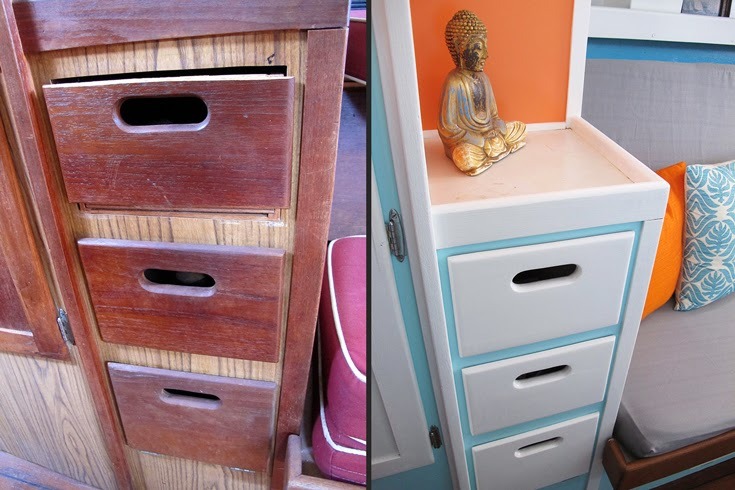 I totally agree, the refitting and redecorating process is so much fun. Hard work sometimes, but such a great sense of accomplishment! Good luck on your second boat and love the name Firefly. OMG I'M IN LOVE. We just got a C&C30 and while it is gorgeously maintained, this is just so refreshing... already sent the link to my husband to convince him ;-) I have so many questions, but I'm going to peruse the hell out of your blog first- found you via Pinterest. You guys are living the dream!! Thank you for making this post! 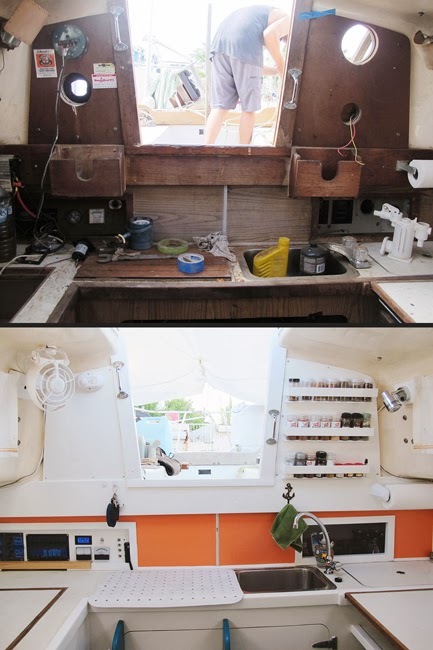 We're getting ready to move onto our boat in about two months, and I was trying so hard to find out how I could paint the inside. My houses have always been so colorful and I was afraid I wasn't going to be able to paint. I can't wait to get down there next month and start adding my own style!!! Your posts are wonderful, your colors are divine and I am soooooooooooo impressed with how much work you did! Awesome! So glad you found our blog then! Go for it! I did end up putting a coat of Minwax Polycrylic protective finish/clear coat over some of the darker colors. The darker the pigment was, the stickier the paint felt. It drove me crazy so I whacked a coat of clear over it and it was great! Super hard finish and easier to keep clean. I ended up putting the clear on a lot of the surfaces just to give it some extra durability. Good luck! Great Job. Beautiful and functional. You think outside the box! 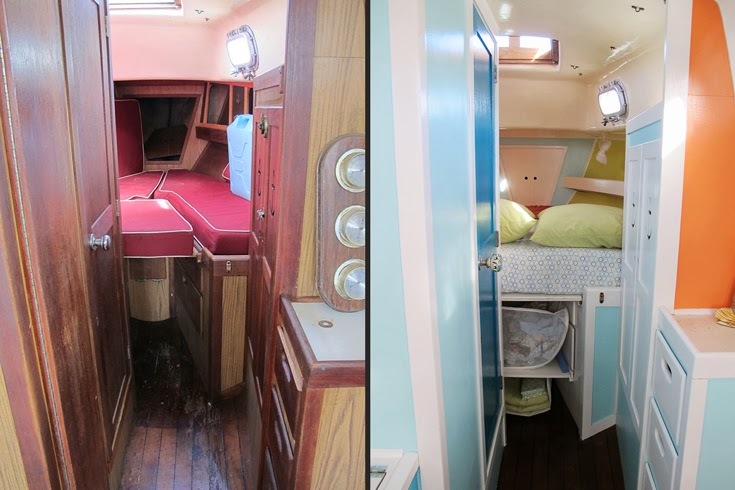 I have a Tartan 34 and have converted one of the main cabin berths to storage, like you did. Great choice of colors. Thank you so much! Love the Tartans as well. Glad you made yourself some more storage. Anything that makes your space more liveable and enjoyable is well worth it! It is so lovely!! Did you paint the inside of the refrigerator and if so what type of paint? Looks so much like a Pearson 35. 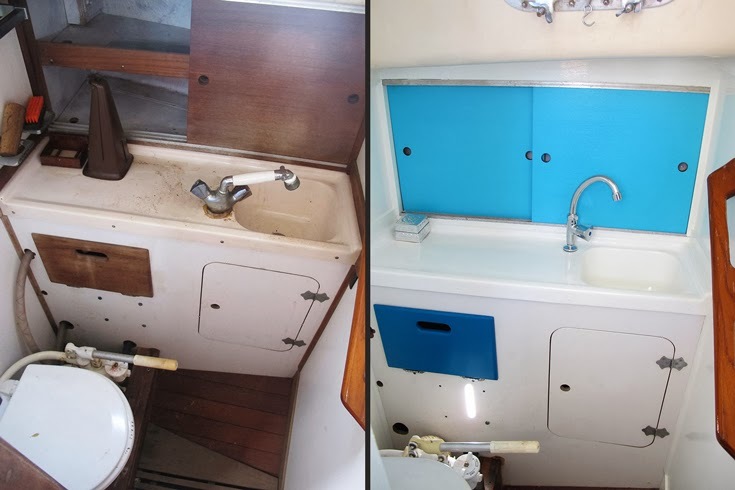 So i stumbled upon your website through Pinterest and I fell in love with the work you've done, I am currently in the process of restoring a 1977 Pearson 33 and honestly I've gotten most of my ideas from you! I just wanted to say that your blog is amazing and that your boat looks beautiful! keep up the good work!! WOW! Thank you! Just clicked on the link and watched the blog. Not sure he liked the colors haha. Not for everyone, but we LOVED little Varuan. So glad she's in the hands of a new owner that appreciates the hard work we did! Good luck on your refit and enjoy! 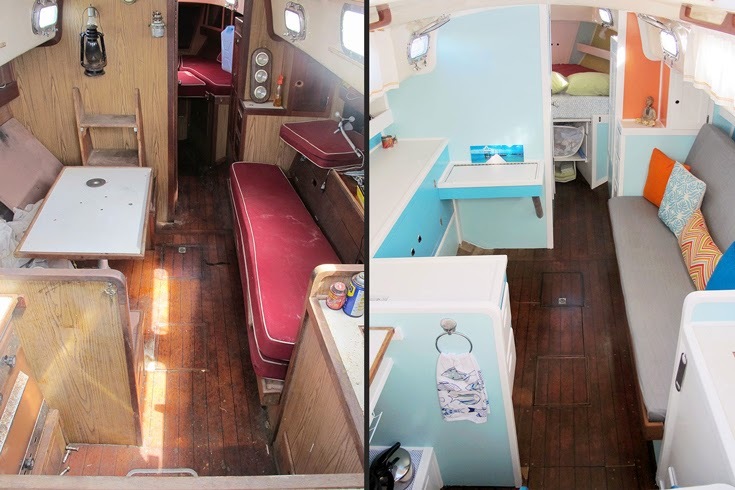 I never considered full interior paint of a boat but this is quite nicely done. Rather like a land house with lots of Home Depot colors. I think good interior design. One thought or question on my mind is if you do get moisture on paneling back sides will it be slightly more problem to dry? Again quite nice looking. Haha how funny is that!! Yes, it's us :) Thank you! We finished her right before we got on Lady Katlo. We loved fixing her up and making her pretty again. It was a fun project with some not so fun parts, but very rewarding. 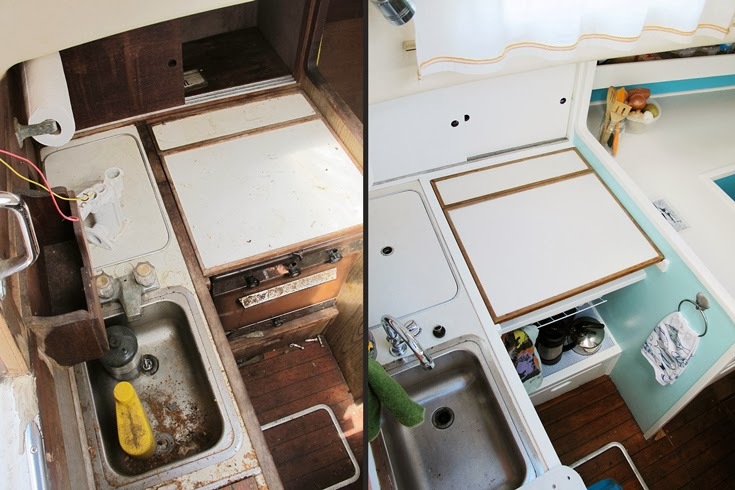 There's definitely pros and cons to an older boat, but we were continually impressed with how well she was made and how well she sailed. We always joked that she was a way better sailor than we'd ever be. You wouldn't believe how thick the hull was. Nothing like these plastic fantastics we're on! I'm glad you found our blog and thanks again for the nice message! Happy end of season and take care guys!! This boat sure is lucky you found her! Great pics, do you have a youtube channel showing the afters of the reno? Wow, beautiful!!! Changing the table to counterpace!!!! question...... how do you like that aspect?? do you miss the table? ?